Trueline’s Full System Compression Joint is ideally suited for insulated systems. Both the top and base sections are manufactured from aluminium and adjacent sections are joined together with a joint clip. With the full system compression joint the top and bottom section are fixed back to the wall. Again this compression joint can be supplied with fully welded corners and end caps ensuring no breaks within the system. The gap has an EPDM foam strip applied to the lower section to ensure that water cannot be driven back into the system. The upper section is supplied mill finish but the lower section can be power coated to a colour of your choice. The system allws fr a number of render thicknesses and this must be specified when ordering. 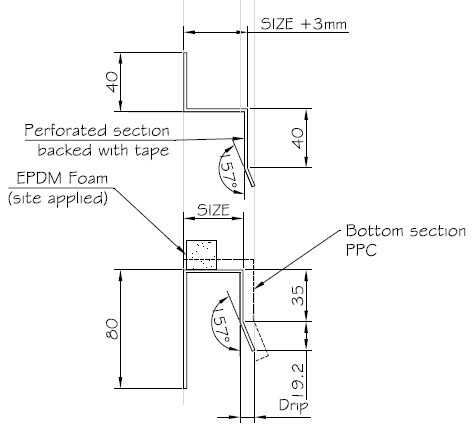 When ordering the top and base sections they are supplied together as a set.